I want to make sure that I can find this great intro to permaculture from the fine folks at ECHO. So, I'm archiving it here. Bill Mollison emphasized the philosophical aspect in his defi nition: “Permaculture is a philosophy of working with, rather than against nature; of protracted and thoughtful observation rather than protracted and thoughtless labor; and of looking at plants and animals in all their functions, rather than treating any area as a single-product system” (Mollison 1988). Rafter Ferguson, a well-regarded permaculture researcher and practitioner, has an elegantly simple way to frame the many aspects of permaculture: “Permaculture is meeting human needs while increasing ecosystem health” (Ferguson 2012). To guard against reductionism, Rafter adds a cautionary statement to his concise defi nition, saying, “I’m all for shorthand defi nitions in the right context as long as it’s being used to communicate a principle rather than obscure fundamental complexity” (Ferguson 2013b). My own defi nition of permaculture is as follows: Permaculture is a cohesive set of ethics, principles and practices that help guide the stewardship of an ecosystem to ensure resilience and abundance to all its inhabitants. The permaculture movement is very open-source and non-centralized. A person wanting to call him/herself a Permaculturalist or Permaculture Designer is expected to complete a Permaculture Design Course (PDC) led by a teacher or group of teachers with sufficient training and experience to teach the course. Courses are off ered through universities, at small farms that have been designed around permaculture principles, and even in the backyards of urban/peri-urban permaculturalists. Each course includes 72 hours of instruction based on the main themes laid out in Permaculture: A Designers’ Manual by Bill Mollison (1988). Courses can be structured many ways: intensive courses take place over nine consecutive days, weekend courses take place over several consecutive weekends, and online courses are typically nine weeks long. David Holmgren (born in 1955) is a co-originator of the permaculture concept with Mollison. Holmgren is an Australian permaculture designer, ecological educator and writer. His 2002 book, Permaculture: Principles and Pathways Beyond Sustainability, provides what many view as a more accessible guide to the principles of permaculture. Holmgren refi ned those principles over more than 25 years of practice. Permaculture practitioners and teachers think deeply about natural systems, and especially about human interaction with those systems. Because technology has increased the capacity for humans to make large-scale and rapid changes to entire ecosystems, permaculture practitioners often fi nd themselves on the front lines of a debate that pits extractive greed against the long-term health of the planet. In this way, permaculture joins the larger movement of those who wish to conserve natural systems and mitigate/restore the damage done by decades of unbridled exploitation. Permaculture’s voice in this movement is valuable because it off ers positive, actionable design alternatives to the status quo. Using a permaculture framework, the design process moves through several levels. It begins with ethics, then moves to principles, next to design strategies, and fi nally to technique or application. 5. Everything gardens (or modifies its environment). Every part of an ecosystem directly infl uences certain other parts of the system and has an overall influence on the system as a whole. In complex systems, changes bring unintended consequences. Careful observation over a long period of time reduces unintended negatives. 7. Design from Patterns to Details. Sort out the big picture fi rst; everything else falls in place after that. Big picture items include factors like climate, terrain and sun aspect. Taking these items into consideration at the very beginning is critical to all of the other decisions that follow, and they ultimately determine the pattern of the design. A permaculture designer uses strategies like sectors and zones (see descriptions below) to help determine the overall pattern. He/she then moves toward specific techniques and plants. 9. Use Small and Slow Solutions. Small and slow changes build resilience and diversity, making our system adaptable and reducing the eff ect of negative unintended consequences. 11. Use Edges and Value the Marginal. The borders or edges between diff erent ecological zones and micro-climates are places of great diversity and potential. Species that can thrive on both sides of the edge have an advantage in these zones and can increase the productivity of the entire system. Zones identify the human interaction required to maintain specific areas of a site. Typically there are 6 zones, numbered 0 – 5. Zone 0 identifi es the home or business structure where people live or work. 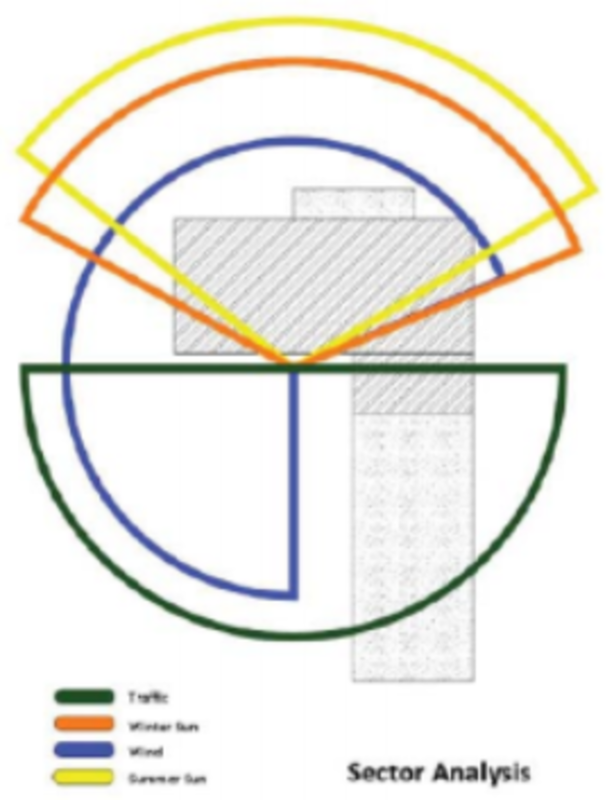 Zone 1 is the high human traffic area of the site; in a residential setting, zone 1 would be the walkway between the driveway and the front door. It would also include the patio or a nearby kitchen/herb garden. Zone 2 would likely include things like annual vegetable beds and chickens, zone 3 would include fruit trees and pasture, zone 4 would have fuel wood, and zone 5 would be left wild to allow for continued observing and learning from nature. Agroforestry and forest gardening are exemplary types of plant guilds. An example of a tropical plant guild would be an overstory tree such as a mango combined with shade-loving Barbados cherries, and below them, comfrey and garlic chives. Agroforestry (multi-story, perennial-based food, fuel and fi ber systems).The above example of plant guilding is also a good example of part of an agroforestry system. Agroforestry systems are designed to maximize the usable yields for humans from a multi-storied forest, while maintaining the diversity and increasing the fertility of the forest itself. A second, more superficial, criticism of permaculture centers around the lifestyles of people who identity with it. Those caught up in a modern westernized paradigm might be tempted to criticize and marginalize those who have a diff erent outlook, rather than try to understand their point of view—especially if that diff erent outlook challenges some of the practices that make one’s life comfortable. Many permaculturalists subscribe to a post-industrial vision of the future. They see permaculture as a tool to prepare for a less mechanized, less economically globalized and de-urbanized world. As a result, they view the development process diff erently than typical traditional western development workers would. This view shapes permaculturalists’ “better future” paradigm, which impacts their choices regarding prioritization of labor and resources. As an extreme example, a traditional western development agency working with smallholders in a rural setting might work to create supply and distribution chains that allow the smallholders access to the global market. It might bring non-local and non-renewable resources into the area to increase yields of a single crop or small variety of annual crops. It might envision consolidating smallholder farms into one larger operation to increase efficiency, thereby creating a smaller, more efficient labor force with the hope that those displaced would fi nd better incomes off of the farm. All these eff orts would be carried out under the guiding vision that the modernized industrial world is our best vision of the future; that increasing the economic base by creating more consumers has no resource barriers that technology can’t overcome; and that hard physical work and traditional rural living are things from which people ought to be freed. By contrast, a permaculture designer working in the same situation would seek to strengthen the independence of the rural community and protect it from outside infl uences. He/she would seek to fi rst create an ecosystem and social system that meets basic human needs, and that then trades out of its abundance, with maximum biodiversity. Rather than creating consumers, good permaculture seeks to create more resilient and successful producers who stay on the land, with the knowledge that their lives are valuable and that their work is among the most intricate and dignifi ed. I was unsatisfi ed with initial answers that were based on experience. icould see the truly unsustainable nature of so much that was being called sustainable. icould see that the enhanced quality of life promised by the modern world often led to greater depths of misery and despair. icould see that when I said the word “development,” I projected a vision of middle class Americana; and icould see that that very lifestyle was crushing the world’s ecosystems and was by its very nature unsustainable. I began to look for a diff erent answer. My reading and research led me to the concept of permaculture. Permaculture provided a new way of thinking about how man could live a productive, abundant life, while nurturing and stewarding creation. I saw that, rather than just laying out a utopian vision, the Permaculture Design Manual and other permaculture literature gave step-by-step instructions for evaluating the natural systems around me and systematically bringing resilience and abundance into those systems. 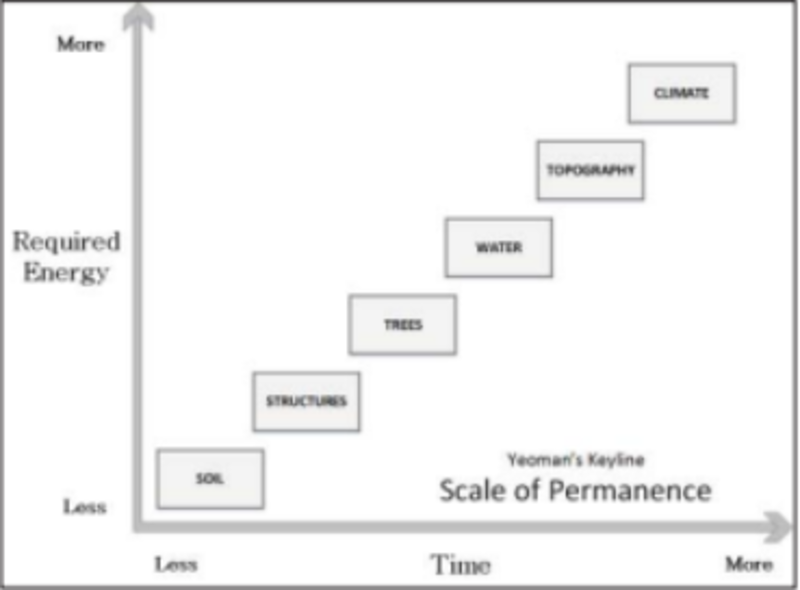 Permaculture design gave me an organized way to look at the big picture, and to plan and test small incremental changes. Permaculture is good stewardship. For me, it is also a way to work for God’s kingdom. I view permaculture’s ethical pillars (listed earlier in this article) through diff erent lenses, so that they become the following: 1) actively love God’s image bearers; 2) diligently steward God’s creation; and 3) live contentedly and joyfully share God’s provision. After practicing permaculture principles on my own for a few years, I took a Permaculture Design Course to increase my profi - ciency and confi dence in using the design processes. The class was challenging and extremely helpful. The exchange of perspective and experience was invaluable, as was having design concepts evaluated by fellow students and a professor. As mentioned earlier, permaculture classes are off ered in a variety of formats. The resource section has some links to well-respected courses. Permaculture is part of the growing community of eco-agriculture disciplines. It is rapidly gaining acceptance as a valuable design methodology in both non-government and government institutions across the globe. It is adaptable to every ecosystem and culture, and off ers accessible problem-solving tools rather than silver-bullet solutions. It considers the ecosystem and social system as a whole, facilitating good stewardship, and providing a pathway to true sustainability, resilience and abundance.